We decided to use 12 fun, themed days to celebrate Christmas with our work family. 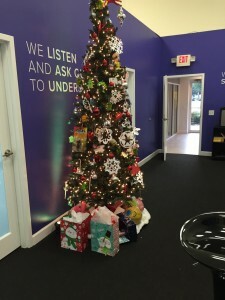 Above, in this blog post’s featured image, you can take in the glory that is BrandCo’s 2015 Christmas tree. 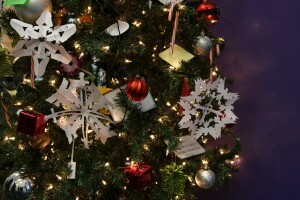 The whole team contributed and came together to decorate the tree with things that are important to us and our work life. You can find everything from desk knick-knacks to post-it notes. It really is a sight to behold. What’s a Christmas celebration without Santa Hats? Well, definitely not one without a couple beers either. Reinbeer day was added in conjunction with Lager Day. Employees were allowed to kick back with a couple of cold ones while working and enjoying the festivities as they donned their Santa gear. Of course, this proved to be a day filled with extreme nerf gun battles, too! 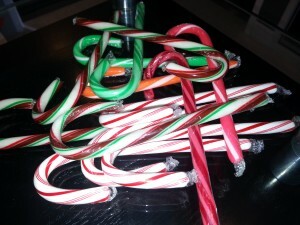 Candy canes are synonymous with Christmas and everyone has to favorite flavor. We purchased an assortment of canes for our team, including Starburst, Sour Patch Kids, traditional red & white peppermint, and Hershey Chocolate Mint. 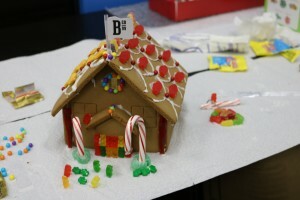 Team building was strong at BrandCo for Ginger Bread house day. 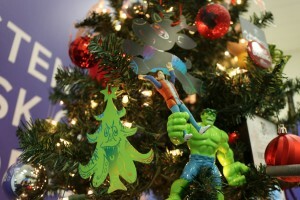 Each side of the office got their own to decorate. Putting the main pieces together even proved difficult for us amateurs, but once we were past that hump, the creativity took over. 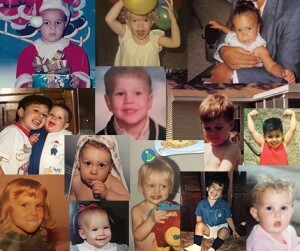 To say that BrandCo’s team were adorable babies, would be an understatement. We were all given a sheet with the baby photos shown here. Can you guess which of us are shown? Curious enough, we all had a lot of trouble picking each other out. This day we also passed around two games of telephone, leading to some completely hilarious stories to read through. Chocolate day was soooo Rich. 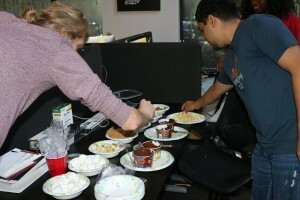 We had everything from marshmallows to Rice Krispy treats to dip in either our choice of milk or dark melted chocolate. Needless to say, our sweet-tooth were fully satisfied. Penguin stress balls and snowflakes were the focus on the Winter Wonderland day. 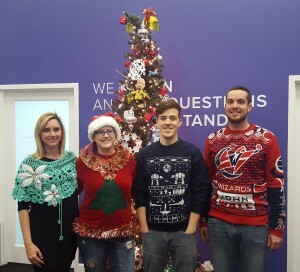 Members of the team cut out and adorned our Christmas tree with themed snowflakes from Star Wars and Game of Thrones (yes, we’re quite nerdy around here). More arts and crafts! 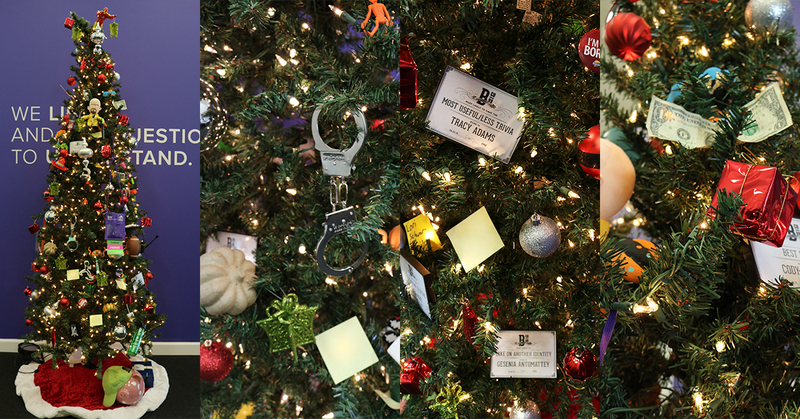 As if we didn’t have enough on our office Christmas tree, we added more on! Each member was given two christmas ornaments to decorate by scratching. 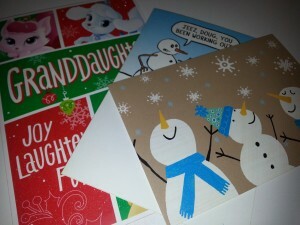 You can make a christmas tree or reindeer ornament. Earlier in the month we were asked what our least favorite things about the holiday season were…and they ended up in a cross word puzzle. 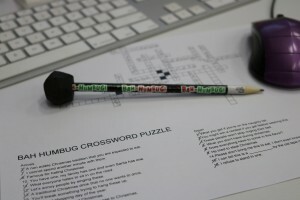 We were all given Bah Humbug pencils to fill it out with, topped with our very own lump of coal. After some bad Oriental Trading reviews, this day didn’t quite go as planned. 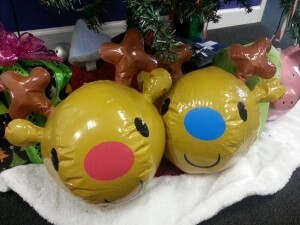 While we were looking to order a really cool antler game that you could throw rings at, we decided to go with these super cute reindeer beach balls to add to the festivities of the day. 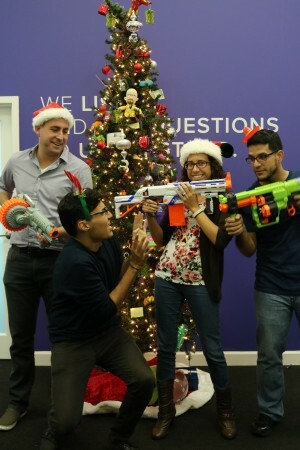 However, like most days, the office ended up breaking out their nerf guns. So, that counts, right? Christmas eve eve was a hodge-podge of yummy goodies, interesting drinks, and bad fashion choices. Gesenia mixed the team up a batch of a Puerto Rican drink called Coquito, which I found delicious. Cookies that we all dug into early in the morning were brought in by Bianca. The four of us left at the end of the day made sure to get a photo of our tacky get-ups in front of our randomly decorated Christmas tree. At the end of November, the team picked names out of a hat to get their Secret Santa assignment. Throughout the month of December, we all learned more about our assigned co-worker and tried to purchase them something they would love. This day we also came into work as comfortable as possible by donning our favorite pajamas. It was a great way to finish the work week before the holiday, by celebrating each other with gifts and comfort. Thus ending another fabulous BrandCo Christmas filled with fun and time spent together.